Two weeks ago at the MaRS Centre, we brought together almost 200 of our community members including IT leaders, researchers, educators, librarians, policymakers and other key stakeholders for THINK, our annual conference. It’s incredible what can happen when you put some of Ontario’s most productive innovators in the same room. This year, we convened bright ideas, examples and insights to illuminate the potential of Ontario’s innovation ecosystem — the complex web of infrastructure, people and investment that contribute to creating a thriving, sustainable economy. I wrote previously about the promising reports of Ontario’s journey here – this gathering served to further uncover what’s working and what needs to happen to ensure we keep on the right trajectory. We know that one of the greatest strengths of Ontario is our diversity. So we brought together an opening panel with unique insights into how Ontario’s ecosystem can be more inclusive, and why that’s an important goal. Moderated by Contact North president Maxim Jean-Louis, panelists talked about how expanding digital connectivity to northern, rural and remote regions of Ontario could improve innovation outcomes. Melanie Muncaster, executive director of the Northern Ontario Heritage Fund Corporation, explained how her organization is stimulating economic growth through funding accessible digital technology and platforms. Nadia Caidi is a professor in the Faculty of Information at the University of Toronto, whose research focuses on the societal implications of information and communication technologies, and information policy. She understands the importance of information resources, institutions and technologies in the lives of under-represented people, so she partners with the Indigenous population in Deer Lake to digitize and publish their community’s stories. IT project manager Gordon Kakegamic is working with Cambrian College to create customized digital learning materials for Indigenous learners at the Oshki-Pimache-O-Win Wenjack Education Institution and emphasized that the technologies required for equal access to the innovation economy is going in the right direction, but that more work is needed. We then broke into special interest groups to address key areas of the issues affecting Ontario’s innovation economy. How do we meet the new cybersecurity challenges brought on by disruptive new technologies? We discussed some best practices in understanding the evolving security needs of our innovation ecosystem and we leveraged our shared experiences to prevent against and deal with ransomware and other kinds of attacks. Many participants took part in our first-ever Certified Chief Information Security Officer and Blockchain workshops, which provided training in the technology expertise that are essential to fueling our innovation economy. An innovation economy needs a well-educated, well-rounded, diverse workforce. What strategies work best to create a diverse and inclusive workforce that has the education and experience to succeed in innovative organizations? We had two dynamic sessions that explored issues around ensuring diverse representation in STEM subjects in postsecondary and secondary schools and creating educational resources and opportunities in different languages. Speaker Rebecca Jamieson, CEO of Six Nations Polytechnic, shared the success story of STEAM Academy run by Six Nations Polytechnic. STEAM Academy offers an innovative model of education integrating science, technology, engineering, arts, math, and traditional knowledge for Indigenous and non-Indigenous students in grades 9-12. The latest truly innovative ecosystem involves autonomous systems working in concert with the brightest minds. We brought together researchers and partners from across institutions as well as cities who are working together to gather and analyze data from these devices to make decisions informed by data, save resources, and create improved services – including healthcare – for citizens. We imagined the impact of 5G technology on the innovation ecosystem and emphasized the importance of collaboration in such a future. Our afternoon closed with a plenary panel on The Innovation Ecosystem, focused on understanding the strengths and challenges of Ontario’s digital economy, and what needs to happen to drive it forward. Dino Miele, CIO of the District School Board of Niagara, described how the innovation hubs his board has created with private companies, postsecondary partners, and the municipal government are addressing civic issues while providing students with real-world learning experiences. Iliana Oris Valiente, managing director of emerging technology and blockchain at Accenture, spoke about the need for government to not only create innovation policy but also use new technologies. David A. Wolfe, co-founder of the Innovation Policy Lab at U of T’s Munk School of Global Affairs, highlighted the success of southern Ontario in attracting investment by international firms because of its high concentration of quality post-secondary institutions. Alison Paprica of the Vector Institute weighed in on how artificial intelligence can promote innovation and foster economic growth. 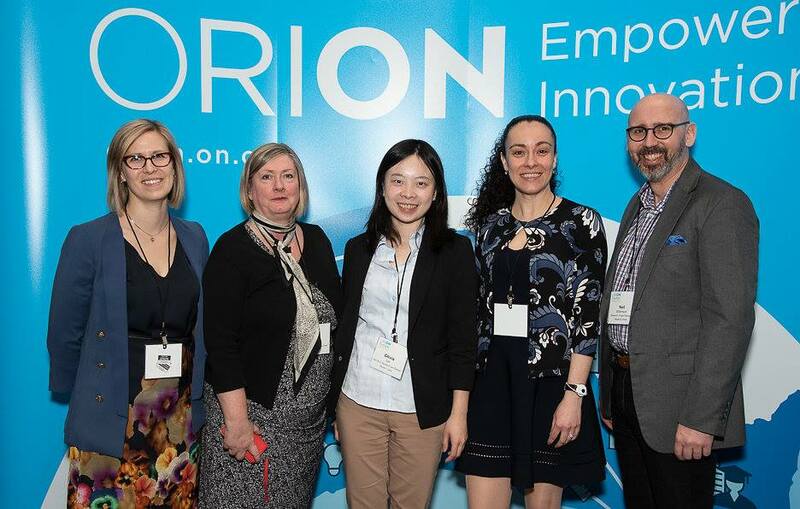 The conference was also an opportunity for us to acknowledge Ontario innovators who have leveraged ORION’s digital tools to strengthen the province. Congratulations again to our Leadership Award winners, John Ferri of TVO, Joanne Borges of Limestone District School Board and Carolyn McGregor of UOIT, and thank you for your immense contributions to Ontario’s digital economy. 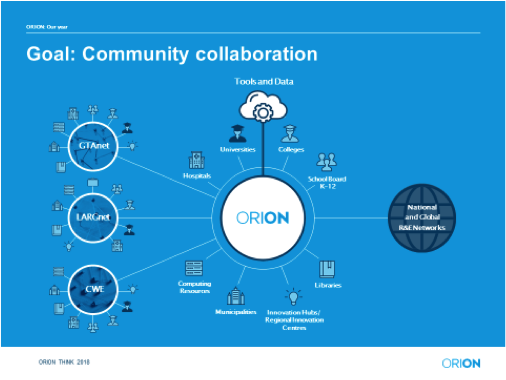 At our annual ORION update, I was excited to share ORION’s momentum over the past year. From improving network performance to connecting five new organizations to establishing a new point of presence in Kingston, we made significant strides in 2017 in our efforts to empower Ontario’s innovators. Going forward, we are focusing on working more closely with others in our innovation ecosystem, including government partners, like the Ministry of Research, Innovation and Science. We are also improving our product offerings, undertaking network enhancements, piloting last-mile solutions, and further developing our shared chief information security officer initiative. What always becomes clear at THINK is how much innovation depends on collaboration. When our school boards, universities, research institutes and libraries find meaningful ways to work together, they come up with creative solutions to society’s biggest problems. What underpins their success is advanced digital infrastructure that allows them to connect to a global grid of like-minded experts and essential data. In the year ahead, we look forward to continuing to serve as the digital backbone that allows Ontario’s researchers, educators and innovators to dream big, collaborate with each other and achieve social and economic progress.